I cannot thank you enough for the very kind and generous welcome you gave us at your church on Thursday. The tour was wonderful and my students were mesmerized by the beauty of what they saw and the stories behind it. The tea was truly above and beyond the call of duty – we are seeing many outstanding examples of medieval art and architecture on this trip, but being served tea in the nave of a Gothic parish church is a uniquely unforgettable experience. Thank you for making a very special contribution to our course. 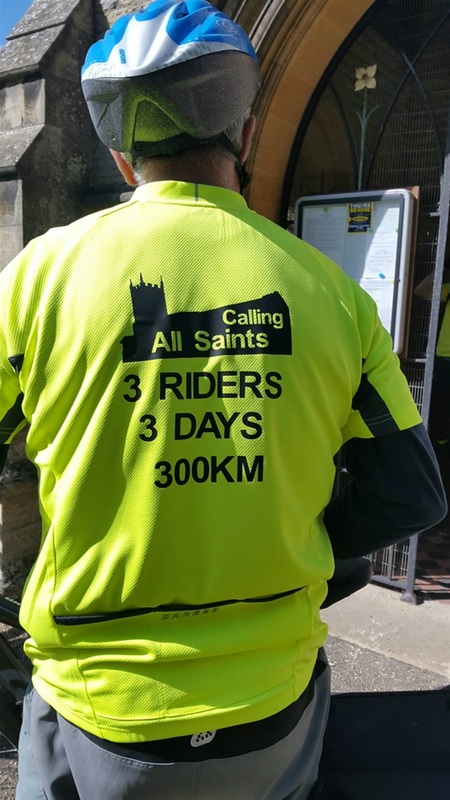 On Sunday 21st August 2016, we were visited by the three bike riders from All Saints' Barnby-in-the Willows on their ride to all the All Saints' Churches in Nottinghamshire to raise funds for their new roof (having had their lead stolen earlier this year). Janine and Paul Stanley and Clem Lee arrived at 3pm in time for coffee and had a quick visit around our All Saints, which none of them had visited before. They had visited all 29 All Saints in Notts on Friday/Saturday and Sunday and photos of all these churches are available on their FACEBOOK site "All Saints Barnby". We took these photos of them at Hawton All Saints which was their last stop before Barnby and home. They have raised a considerable amount of money and ridden 300kms. Well done.